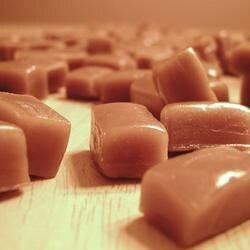 "Rich, chewy caramel to individually wrap or use in candy making." In a heavy bottomed saucepan over medium heat, combine the butter, brown sugar, sweetened condensed milk, corn syrup and salt. Bring to a boil, stirring constantly. Heat to between 234 and 240 degrees F (112 to 116 degrees C), or until a small amount of syrup dropped into cold water forms a soft ball that flattens when removed from the water and placed on a flat surface. Cook for 2 minutes at that temperature. Remove from the heat and stir in vanilla. Meanwhile, butter a 9x13 inch baking pan. When the caramel is ready, pour into the buttered pan. Allow to cool completely at room temperature. Remove from the pan and cut into squares using scissors. Wrap individual pieces in waxed paper or cellophane. This recipe rocks !! The first time I made it the carmel did'nt hold it's shape but was still good. The next time I made it I cooked it to firm ball stage about 248 ( about 20 min).